There’s nothing I love more than finding new places to eat in Toronto – I’m slowly working my way through an endless number of restaurant recommendations! Last week, Mle and I decided to wander downtown and check out some new restaurants and cafes. Coincidentally, both places were for Japanese style cuisine. If you’re a frequent reader of this blog (or instagram follower), you’ll know that I absolutely love Japanese curry! I even posted a recipe a little while ago! Gyugyuya curry had been on my list for a while and I was seriously craving a hot bowl of the stuff! 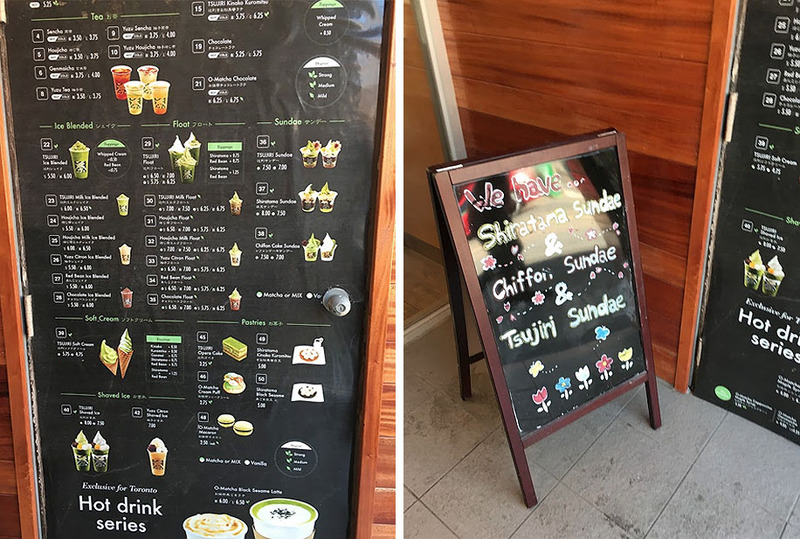 Mle wanted to try out Tsujiri Matcha Cafe as well, which was just down the street. Lunch and some matcha sundaes? Sign me up! I discovered Gyugyuya Curry when lining up for Sansotei Ramen last month (read about that here), as it’s right next door! 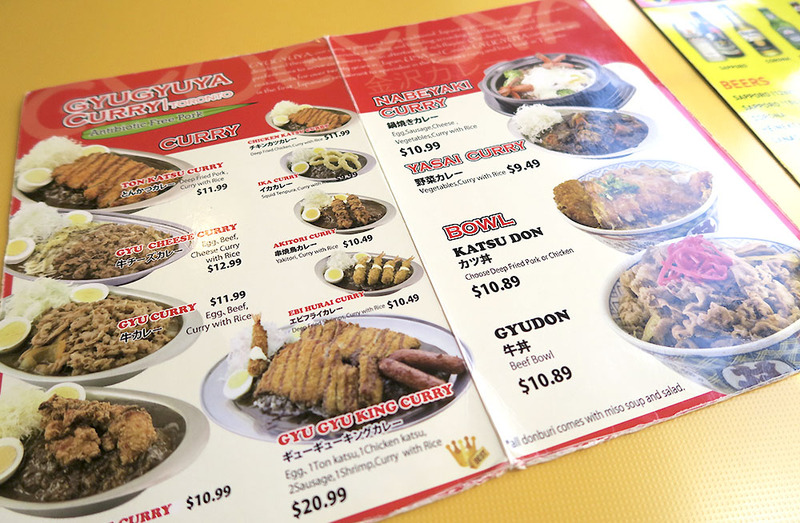 Despite the small restaurant size, the bright yellow interiors of Gyugyuya and welcoming scent of curry are warm and inviting. I’d say it fits about 30 people, and seems to be a quick-serve restaurant. We arrived at about 1PM on a Wednesday and were seated immediately as there was no line (hooray!) There seemed to be a few waitresses on hand to take our order and serve the food! The menu has typical Japanese appetizers like edamame and gyoza, but heads up, you’ll probably want to save your appetite for the main dish. I ordered the Nabeyaki Curry (which includes an egg, sausage, cheese, vegetables, and curry with rice.) 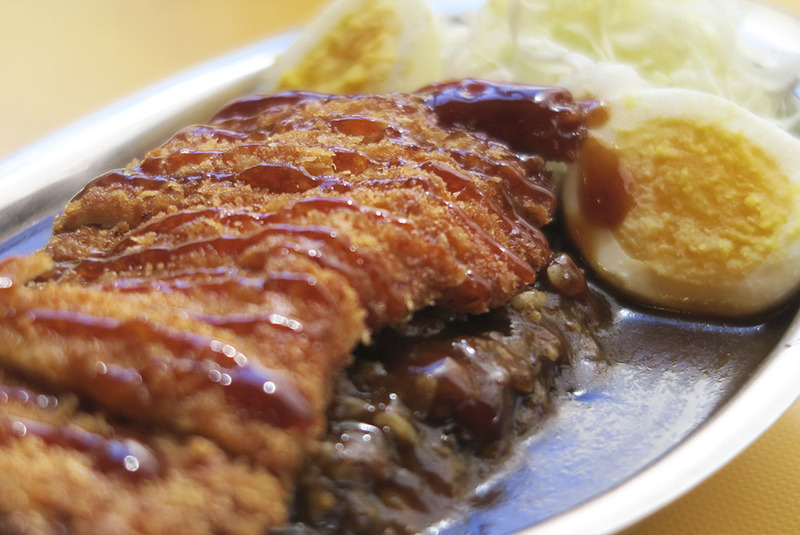 Mle ordered the Chicken Katsu Curry (deep fried chicken with rice, egg, and cabbage)…. Emily got the Chicken Katsu and it looked delicious! I think I’ll try that one out next time. Overall, I liked this restaurant. 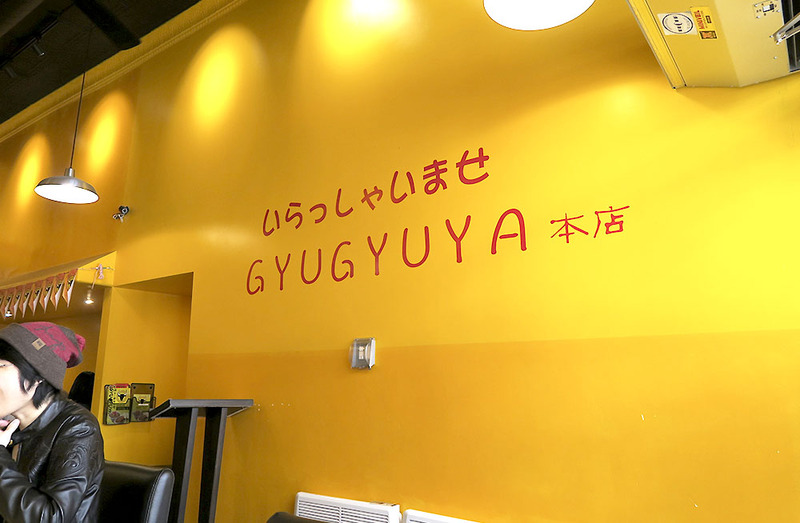 If you’re looking for a quick place to try out that’s filling, delicious, and inexpensive, check out Gyugyuya! 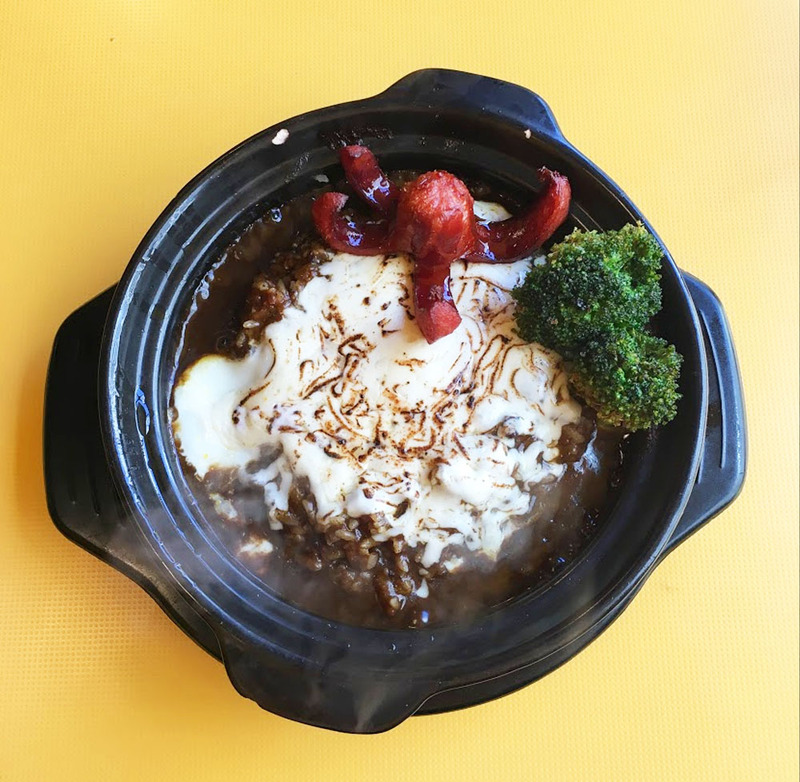 After filling ourselves up with piping hot curry, we set out for Tsujiri to get our sweet fix. 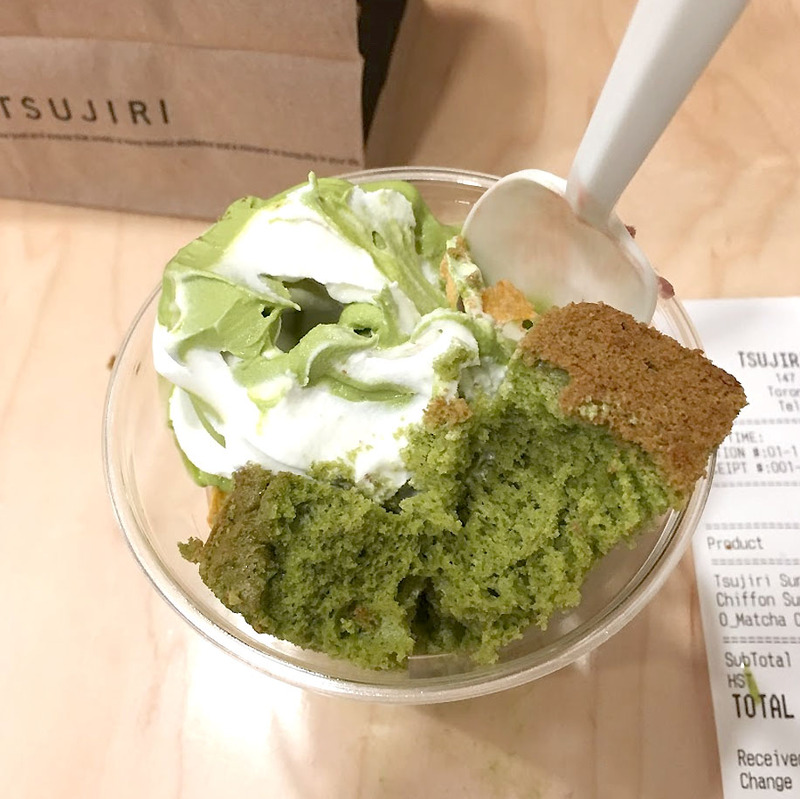 Only a few shops down, Tsujiri is Toronto’s hyped up Japanese Matcha Cafe – everything is matcha tea flavored! 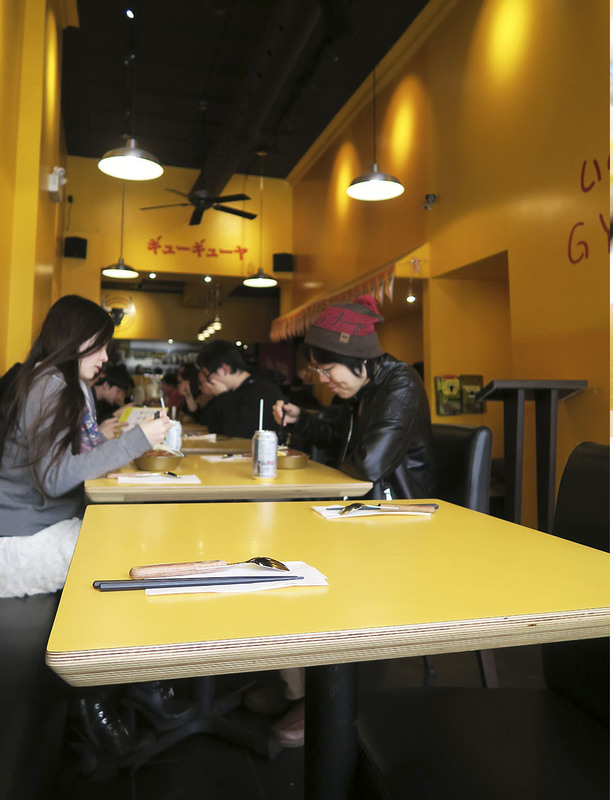 Like Gyugyuya, the cafe is very small and is mainly for takeout desserts, although there is seating. The cafe’s popularity means that more often than not, the line extends out the door. We were lucky and arrived with only one person ahead of us! Shortly after, the line tripled in size. The shop itself is decorated in a very Japanese style, from the color schemes, wooden paneling, to the inside seated area. The cafe offers a selection of hot beverages and teas, lattes, ice creams, shaved ice, cream puffs, and cakes. 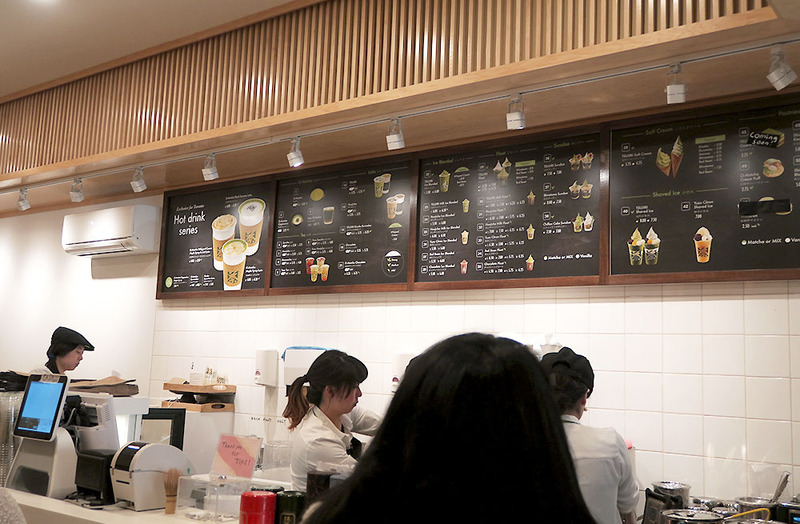 Although it’s a matcha cafe, many of the ice cream options offer a matcha/vanilla swirl, or plain vanilla flavor soft serve. Take note – Tsujiri only accepts cash. 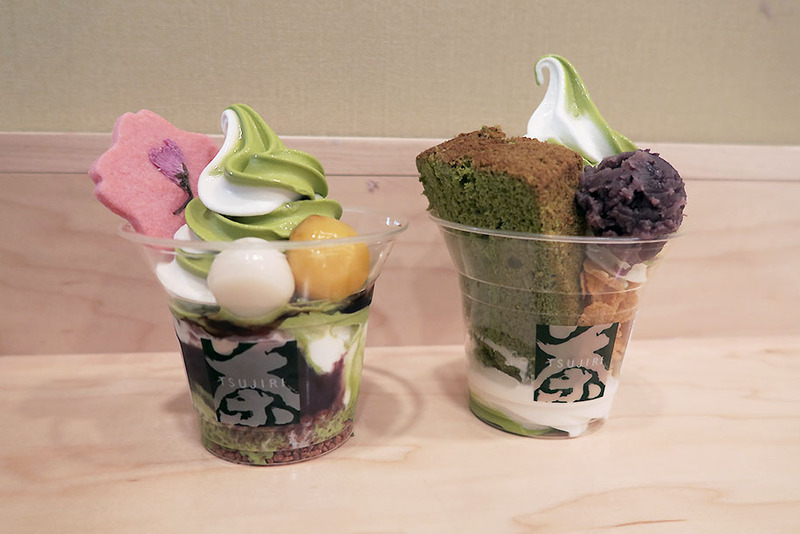 Mle’s friend had recommended the matcha sundaes – I ordered the Chiffon Cake Sundae with a mixed vanilla/matcha swirl, and Mle got the Tsujiri Sundae (also with matcha/vanilla). Although I like matcha flavoured sweets, I wasn’t exactly sure how strong the matcha taste was going to be. The vanilla and matcha swirl is a nice balance as the vanilla gives a more creamy and subdued flavor. So pretty much, if you’ve never tried matcha… go for the swirl! The Chiffon Cake Sundae was absolutely delicious – the cake was a bit dry but had a soft and light texture. Beneath the soft serve was a layer of cornflakes, which lends a pleasantly surprising crunch! There was also a ball of red bean paste which I traded Mle for her chestnut because I don’t like red bean…. The Tsujiri Sundae was a mixed swirl of soft serve atop a layer of granola, layered with red bean syrup and topped with a sakura cookie, rice mochi, and a ball of chestnut. The chestnut was really stinky for some reason but it tasted really nice! Both sundaes were $7.50 each.. I also bought a green tea cream puff (not pictured)! It was a soft cream puff with a baked outer shell, filled with whipped matcha cream mousse. It had such a lovely flavor, but disappeared all too quickly because it was quite small and delicious. I highly recommend Tsujiri. Their prices run a bit high compared to other bakeries around Chinatown, but worth it for the specialty Japanese cafe experience and flavors! Try to avoid peak hours if possible – on the night we went to Santosei, the line for Tsujiri went out the door and past a few shops. The shop is small and only have a few staff, so don’t expect the line to move too quickly! We were soooo full from eating that we had to take a break. 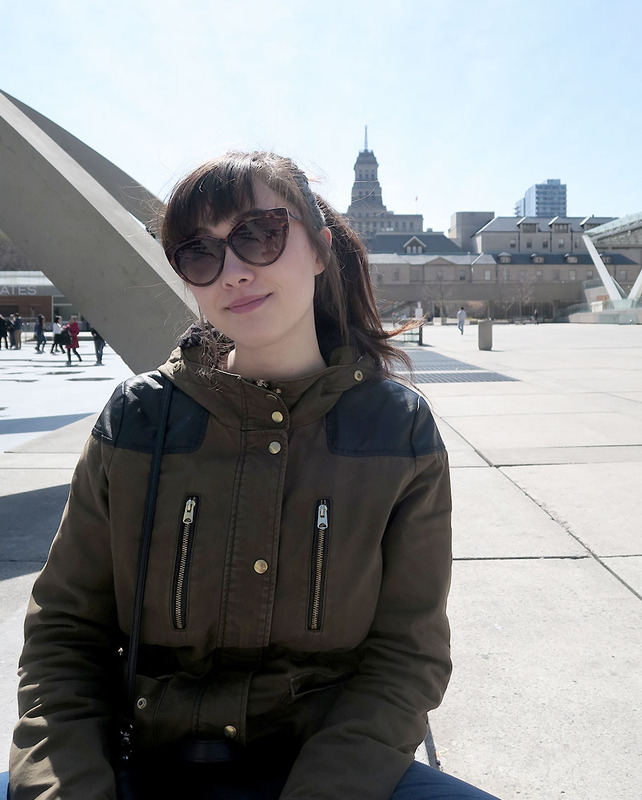 We wandered around Eatons for a bit, walked to Nathan Philips Square, and sat for a bit. The weather was really nice, although it has gotten a bit cooler these past few days, down to about 10C! I don’t really mind it but my nose always get stuffy and that means I usually end up rubbing all of my makeup off. Our food tour continues at Uncle Tetsu’s Angel Cafe, aka Toronto’s first maid cafe! I’m sure you’ll all be curious so I’ll be dedicating my next post entirely to our experience there… Keep your eyes peeled! 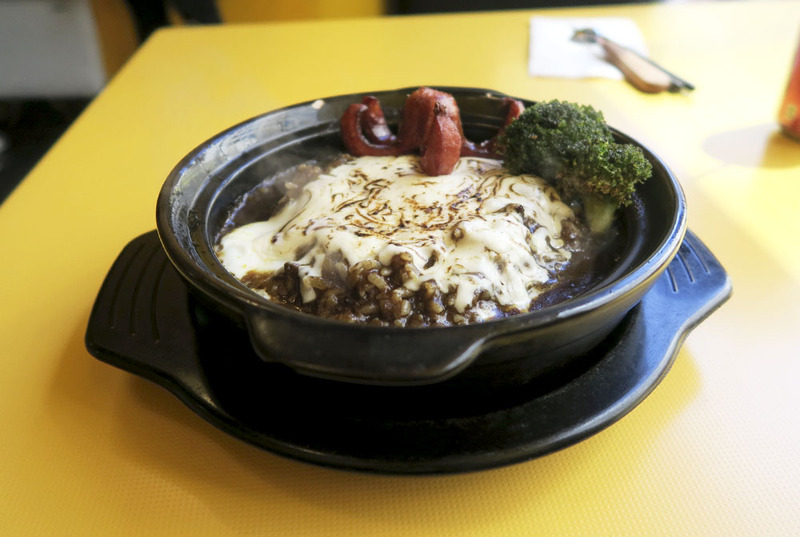 Have you tried Japanese curry before? Or Matcha flavored desserts? 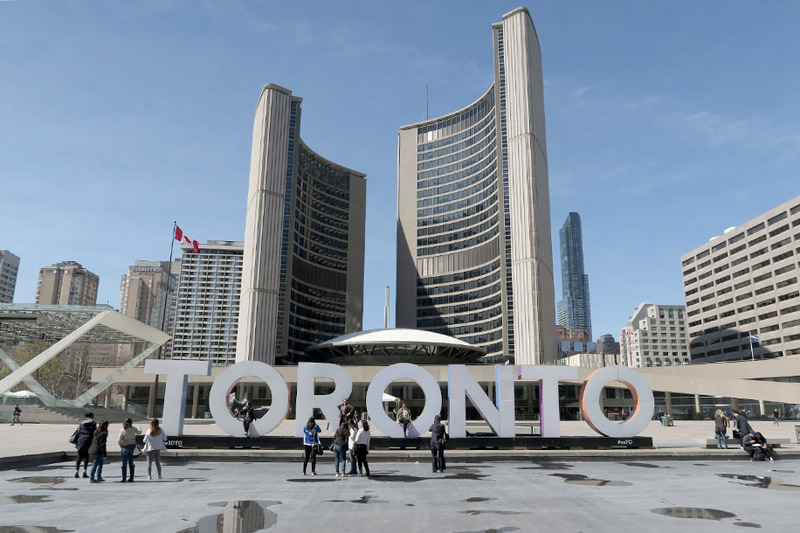 What are some of your places to eat around Toronto?